With the men's Big Three University Ekiden season well underway, Japan's university women kick off their own Big Three this Sunday at Sendai's Morinomiyako Ekiden, the National University Women's Ekiden Championships. With six stages totalling 38.0 km, a longest stage of 9.2 km, 26 teams from across the country and a live nationwide broadcast on NTV Morinomiyako is similar in scale to the men's season-opening Izumo Ekiden. Defending champion Ritsumeikan University of Kyoto comes in ranked #1 again with four-straight national titles and nine wins in the last twelve years. With the #1 and #3 ranked runners in the field, third-year Natsuki Omori and second-year Kotona Ota, and the fastest top-six 5000 m average, 15:45.73, there is almost no chance Ritsumeikan will lose. The last team to beat them, 2009-2010 national champion and crosstown Kyoto rival Bukkyo University, has long since faded from glory with the departure of head coach Kenichi Morikawa for the Yamada Denki corporate team. The only other team to beat Ritsumeikan in the last decade, Nagoya's Meijo University, is ranked #5 with a top-six average of 15:57.91, meaning it's up to some newer blood to take them on. 2015 National University Women's Ekiden Championships top 12 rankings. Click to enlarge. Last year runner-up Daito Bunka University of Saitama gave Ritsumeikan a run for it, finishing just 21 seconds back. This year Daito Bunka looks almost equally strong with a top-six average of 15:51.04, but just eclipsing them is Kanagawa's Nittai University, winner of last month's Kanto Region qualifier. Nittai has a top-six average of 15:50.61, enough to put them in range of Ritsumeikan alongside Daito Bunka should anything go wrong up front, and Morinomiyako's longest stage being 9.2 km it could come down to 10000 m credentials in a race for 2nd. Nittai's best woman, second-year Yuri Karasawa, has run 33:03.25, while Daito Bunka third-year Fuyuka Kimura has run 33:02.54. It's just too close to call, but the joint Nittai and Daito Bunka chase after Ritsumeikan should be the highlight of the race. And with four of Nittai's top six being first-years they may be at the start of a progression that could see them topple the Ritsumeikan dynasty two or three years down the road. 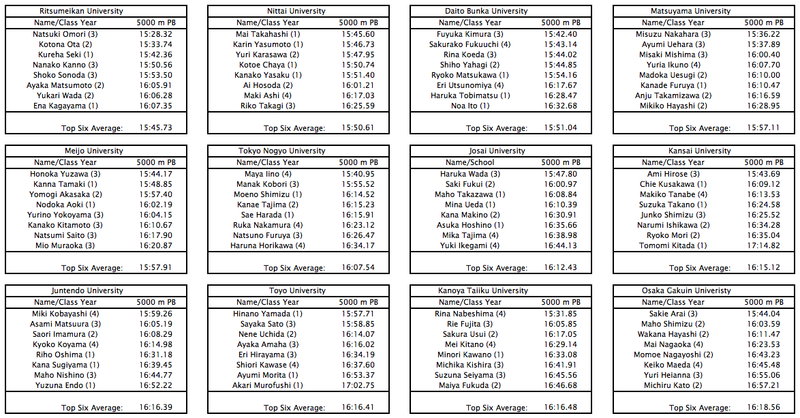 Rounding out the five schools with sub-16:00 top-six averages, Ehime's #4-ranked Matsuyama University 15:57.11 top-six average sets it up for another good race against #5-ranked Meijo. The top eight at Morinomiyako are seeded for the following year, meaning they don't have to run September's regional qualifiers. With a top-six average of 16:07.54 Tokyo Nogyo University looks like a lock for a seeded finish at #6, but the 7th through 12th-ranked teams including last year's third-placer Osaka Gakuin University are all close at the 16:12-16:18 level. 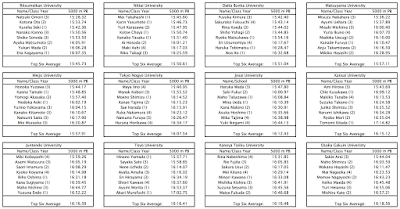 Between Josai University (Saitama), Kansai University (Osaka), Juntendo University (Chiba), Toyo University (Saitama), Kanoya Taiiku University (Kagoshima) led by 2015 National University 10000 m champion Rina Nabeshima, and #12-ranked Osaka Gakuin likewise led by 2015 National University 5000 m champion Sakie Arai, any two of them could take the final seeded places in 7th and 8th. 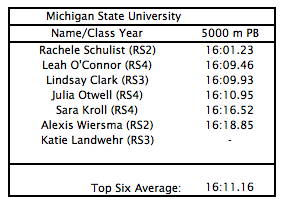 By comparison, in the NCAA where university women spend the fall season focusing on 6 km cross-country, almost identical in distance to Morinomiyako's 6.33 km average stage length, 2014 NCAA XC national champion Michigan State University had a top-six average of 16:11.16 at the time of its win, putting it right in with the group of six Japanese schools contending for 7th and 8th place. The Morinomiyako Ekiden will be broadcast live nationwide on NTV starting at noon on Sunday, October 25. Check back on JRN for results and report post-race.